The air conditioning and wi-fi in the room, mineral water during the meals, Tourist Tax. 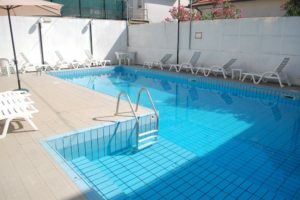 The following prices are per person per day in a double room for a minimum stay of 3 days. The room is available from 12.30 on day of arrival until 09.00am on day of departure . The last booking date is the day of departure. 1 lt. of mineral water+ 1/2 lt. local wine with meals per day per person. Prices are per person per day with a minimum stay of 7 days with 2 people. The hotel issues a voucher to deliver the bathing attendant.